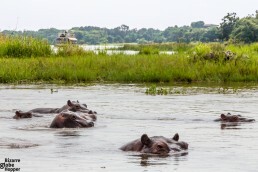 Viewing game on a boat is a totally different experience than the traditional game drives done by the 4WDs. 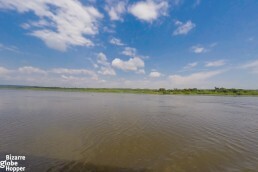 It’s amazing to float in a little boat on the mighty river Nile, amidst the hippos and crocodiles. 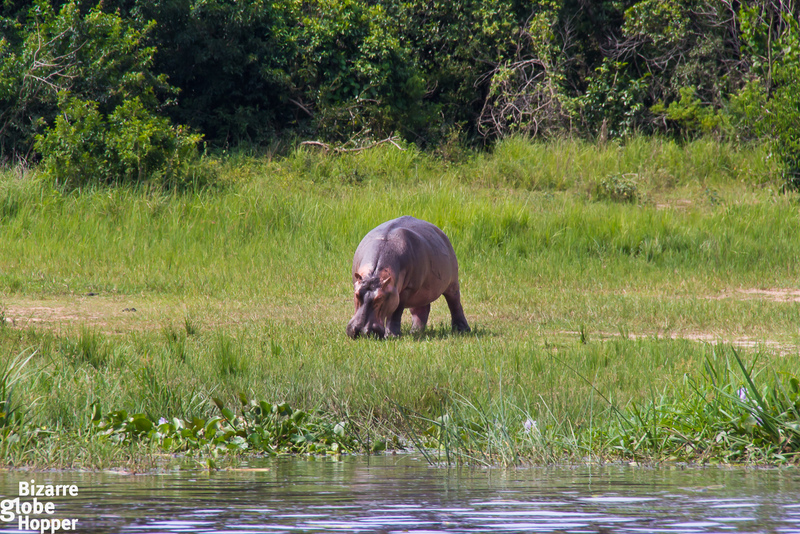 The banks of Nile are filled with wildlife, which you’ll see from a whole another perspective. We were driving in a big hurry on the red dirt road of the Murchison Falls National Park, towards the dock, where our boat was already waiting for us to join a game river cruise. 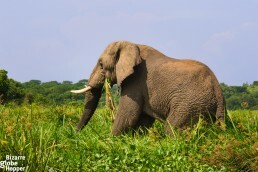 We were bound to see all the wildlife living on the shores of the Nile and the magnificent Murchison Falls itself. 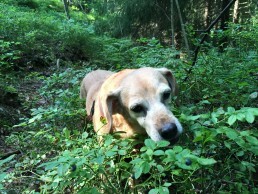 When we were about 10 minutes’ drive away I suddenly heard a really bad noise from our jeep – we had just got a flat tire! The time was ten to two o’clock already and we were supposed to reach the boat at 2pm. At that moment I felt hopeless: now we’d inevitably miss our boat, despite all the hurrying. But our guide, Paul, hadn’t given up.  He called the boat master, sprinted out of the jeep and began to change the flat tire in a record speed! While we watched him in awe, he changed the tire in about 10 minutes (yes, in 10 minutes!) and we were back on track, driving towards the dock. Because of his rapid save we did catch our boat after all. We had a small, but convenient boat with one ranger on board as our guide. 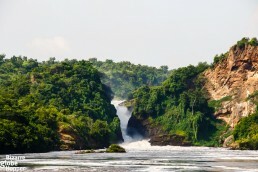 The channel leading to the bottom of the famous Murchison Falls got us through flocks of different animals; we saw hippos, crocodiles, elephants, warthogs, kobs, oribis, and countless species of birds. The feeling in the middle of all this natural beauty was just awe-inspiring. Our first encounter was a big horde of hippos; floating just few meters away from our boat. 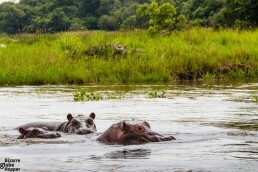 I suddenly remembered that according to the African people, hippo is the most dangerous animal of Africa. When staring into one’s huge, yawning mouth so close to us, I found it very easy to believe. 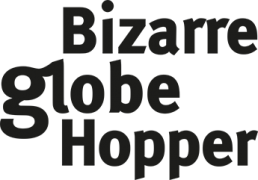 A hippo could easily kill a human by its shear weight alone. Trodding aside the slight feeling of nervousness about what would happen if one of the hippos got angry on us, I concentrated on photographing their floating heads on the surface. We navigated slowly in the middle of the grey giants, trying to guess where they would pop up next. It’s rare to see hippos out of the water, but here we saw few of them, grazing on the green grass of the bank. We also had a cooler box on board, filled with cold sodas, water, and a local beer called ”Nile”. So after a while, we decided to uncork a couple of beers and toast for our ride on the Nile. What a great way to enjoy the experience, right?! 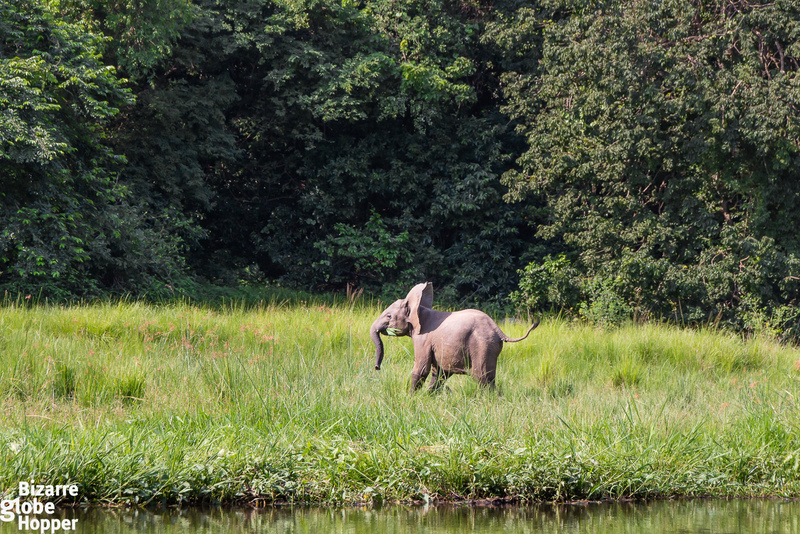 Next, we spotted a female elephant with her infant, eating grass on the nearby bank. 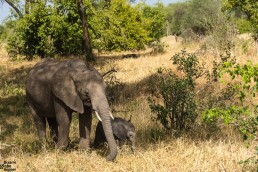 The driver slowed down the motor, but when we approached, the poor little one still got scared and ran away to his mother – still with a mouthful of food. We saw plenty more elephants further down the river. This time, it was a full herd. One individual with giant tusks was standing in the shallow water on the shore, really close to our boat. It seemed undisturbed by us and just kept on feeding. It felt like it’d have been only an arm’s length away. Such a beautiful sight! Because of this golden opportunity,I got a few good, close-range shots from it. 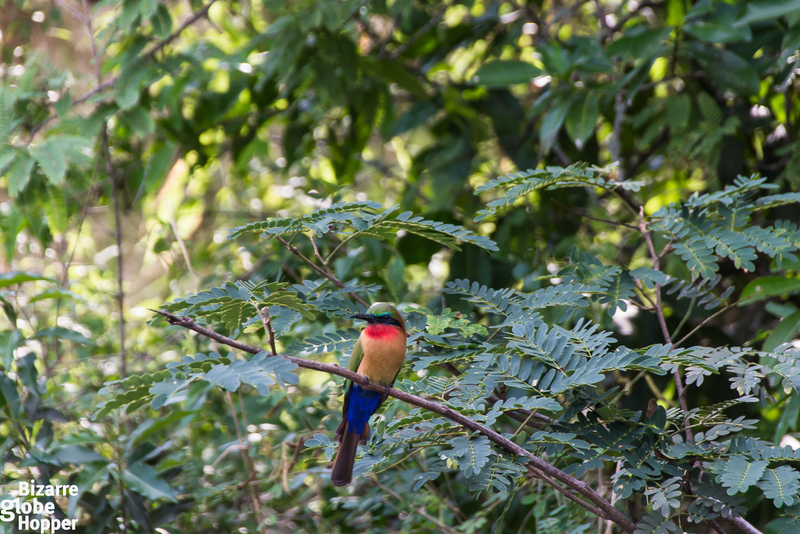 In addition to all the mammals, we saw so many different bird species with complex names that we lost count. I did manage to capture some of them with my camera, but to get more detailed shots you would have needed a telephoto lens. I didn’t let it bother me too much. At least I had more time to concentrate on the experience itself, rather than just looking everything through the viewfinder. The rugged shores further down the river were filled with tiny holes. Actually, the rocks were dotted with the nests of Kingfishers. 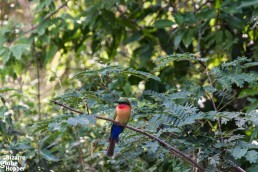 There are crowds of Kingfishers here and we did succeed in seeing a few of these beautiful, colorful birds. Though they are so tiny, that a really good view would have required binoculars. 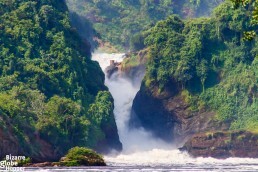 After awhile we finally began to reach the great Murchison Falls. The current started to amplify and our boat parked to the shelter of some rocks. From there we got to climb onto the rocks to get a pretty nice view of the falls itself. We were actually still quite far away, but this was as close as you can get with a boat, because of the strong currents of the White Nile. But with a nice zoom lens, you’ll still get good frames of the falls. Just be careful on the slippery rocks and wear steady shoes. You don’t want to fall into the cold river water inhabited by crocodiles. 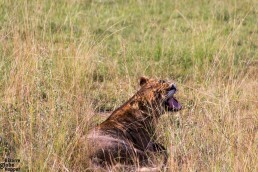 We saw quite a few of these nasty creatures during our way back. One especially huge crocodile was just lazying around on the riverbank. We floated really close, which unravelled its enormous size. It could have jumped into our boat anytime it’d have wanted to. 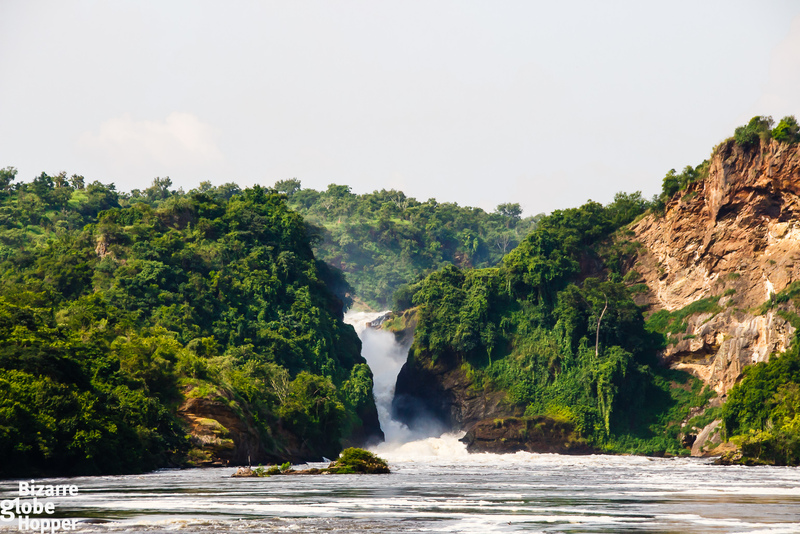 Though you cannot go so close to the falls with a boat, you can visit the Murchison Falls on a separate nature walk. It’ll take you at the top of the Falls where you can see the huge power at close range; the thundering roar when the water forces its way through the narrow gap. We did that too, of course. You can read more about it in a separate post in here! Step onboard and check out the video from the cruise! 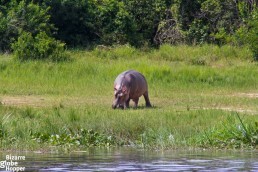 I’d say seeing game from a boat is one of the must do’s on the Nile and is a different kind of Murchison Falls safari. Have you visited the Murchison Falls National Park? Tell us, we’d love to hear about your experiences! *Disclaimer: We were hosted on a tour in Murchison Falls National Park and around Uganda by Mamaland Safaris, but all the opinions and views expressed here are totally our own.